The system images provided by the Raspberry Pi foundation are designed to be as small as possible in order to support small SD cards. When these images are applied to large SD cards (typically greater than 4GB) there is a significant amount of unusable space left on the SD card. 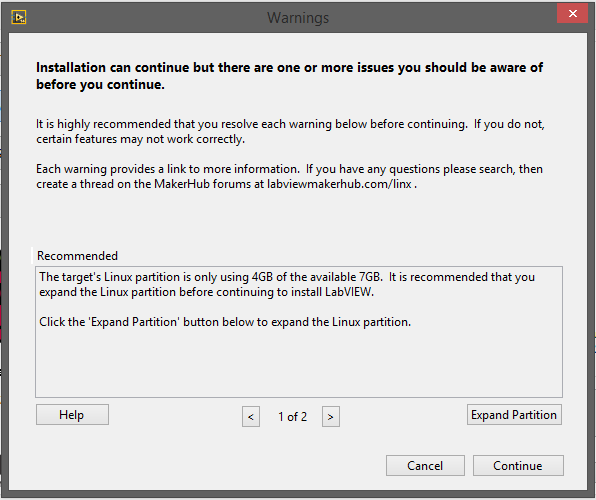 Expanding the primary partition to use this previously unallocated space allows access to the full capacity of the storage device. During the software installation process the LINX Target Configuration Wizard will display a warning if the target device is not using the full capacity of the storage device and provide the option to automatically expand the file system. SSH into the Raspberry Pi. Choose 1 Expand File System.